There is not much on line about this variety only this in a varietal list: View Here. What caught my attention was the maturity period, January to July, very long and it could possible fill in a void in South Florida. Also the friend who got me the bud wood indicated that this was an old variety who fell by the avalanche of Hass Avocado. Some thought it had disappeared I'm not sure who found a tree and the report is that the fruit is of excellent quality and it produces well, From the description seems more of a Mexican type so it should do well here. No idea when it would flower or when the fruit would mature in So. Florida. It is a beautiful free, not the usual shape of an avocado. The leaves are large and wide. The tree is growing well and will provide bud wood to top work a tree in late 2013 or early 2014. January 21, 2014: A tree was top worked in December and is showing signs of buds pushing out in several of the grafts. February 14, 2014: It took a while but this tree is taking off. Some of these short bud wood, I call them wedges, seem to be working real well. The January 17, short bud wood is now over 16 inches long in less them a month. February 25, 2014: The potted tree I took the bud wood from flowered and like I suspected it is a B flower type. I'm excited about this tree I hope we get to taste the fruit next year. I suspect it will flower early. 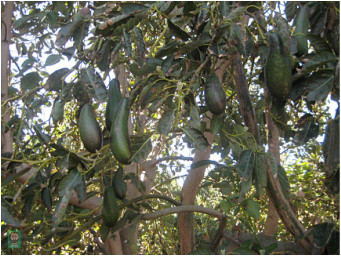 March 26, 2014: I got from Richard a couple of pictures of Rockwood Avocado. Not a lot of pictures out there of the tree and fruit. February 26, 2015: The tree is doing good. Is not a big tree but is healthy, more of a compact or just a slow grower. Seems weeks away from flowering which can almost assure me will be a late variety unless it is thoroughly t confused by its location. May 30, 2015: The tree is doing well. On its first flowering just set a couple of fruits. So far they are small. Seems like it could be a late variety here.